Golfers would be forgiven for skipping the 17th hole at an Australian golf course after a python devouring a wallaby rolled onto the course. 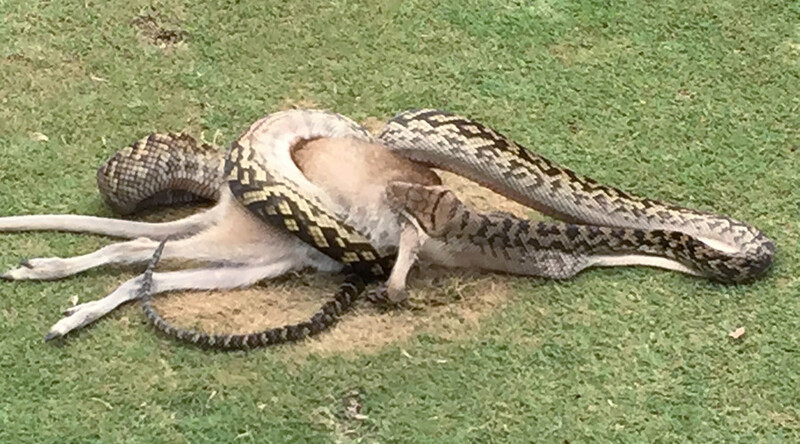 The 4-meter (13ft) python enjoyed a 30-minute buffet with stunned golfers looking on as the wallaby somehow fit between the jaws of the determined snake at the Paradise Palms golf course in Queensland, according to The Cairns Post. One witness admitted to sometimes seeking out snakes during a round, something he won’t be doing again. “I have a good look when I play a golf ball near the swamp, but I will be thinking about that again, because that is a big beast,” said Robert Willemse. 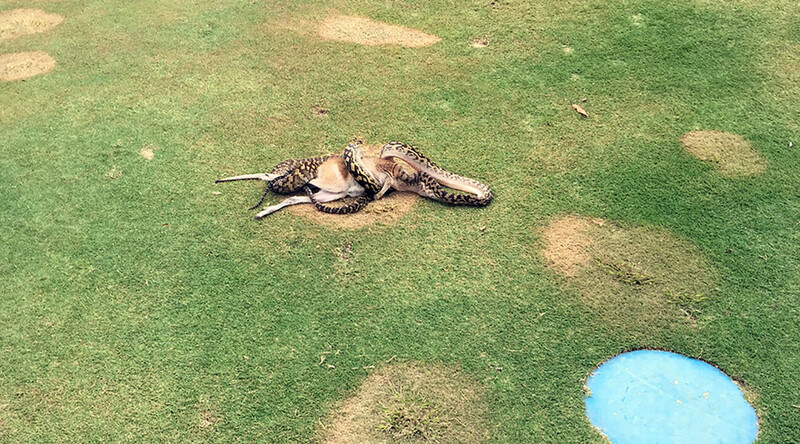 Willemse said it appeared the python rolled onto the fairway about 200 meters from the green after managing to get the wallaby’s head in its mouth. “The python swallowed it and rolled into the creek, then snuck back into the bush. It must have gone for a rest for the next few days,” he joked. The animal carnage, which wouldn't look out of place in an episode of ‘Planet Earth,’ was exceptional according to manager Declan McCollam. Although the course attracts bandicoots, wild dogs and foxes due its “rainforest-style”, this was the first time golfers have seen an animal devour another, according to McCollam. “The wallabies are a great attraction for the golf course. At the same time, it is always good to know the snakes are not endangered either – it was pretty amazing,” he said. The snake was believed to be a scrub python, capable of growing up to 8.5 meters long. This particular snake is believed to have dropped from a tree to catch its prey, as it would have been too small to capture the wallaby in an open space.